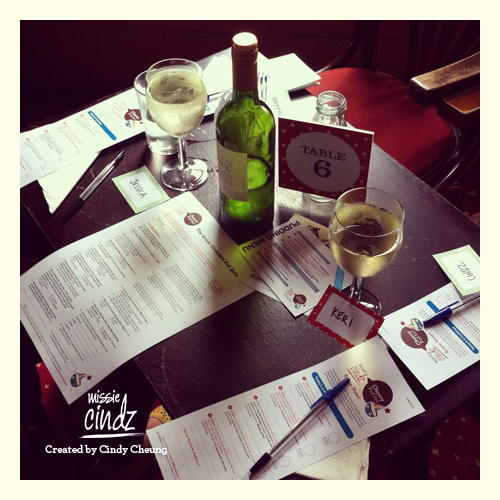 Last weekend (23rd June 2012) was our fourth Missie Cindz Pud Inn Club held at the Rutland Arms. 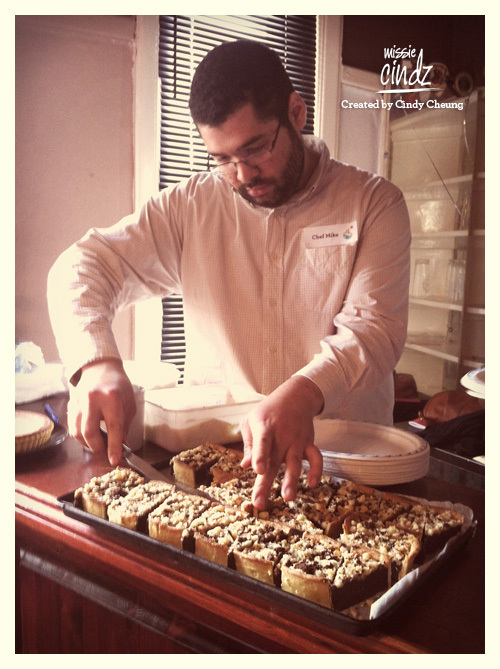 Serving five homemade puddings cooked from scratch, an event that is usually enough to impress hungry diners — especially when the menu includes CHOCOLATE and made from local bakers and chefs. The Rutland's Chef Mike getting down to business with the sweet stuff!! – choccy tart anyone? Course 1: first up at Pud Inn was Rutland Arms Chef Mike’s choctastic tart with macadamia nuts served with white chocolate chip ice cream. Chef Mike’s pudding creations have been voted our diner’s favourite for the past two times (source: from our diner’s score and feedback sheets) – and was he crowned favourite again? – you’ll have to carry on reading to find out. It was great having Chef Mike sat in with us for the event. Getting food producers involved with the event’s happenings plays an important element to why Pud Inn happens and its success. 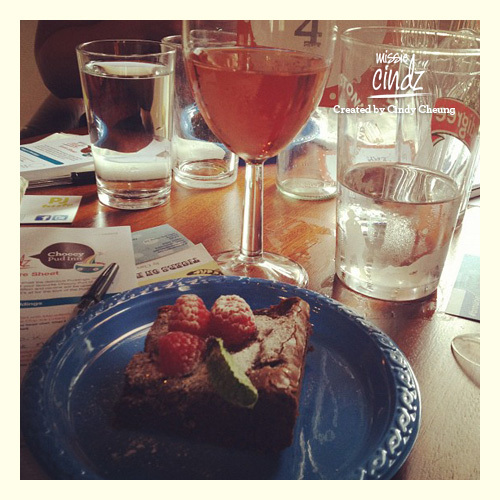 Next up was course 2: sparkly triple Belgium chocolate brownie topped with milk, dark and white chocolate served with seasonal British raspberries made by Sheffield’s #Brownies, who bakes more than 1,000 tasty treats every week. Congratulations to #Brownies Andy and Wendy who have recently just won TV Dragon’s Den star Theo Paphtis #SBS award! – a twitter initiative called Small Business Sunday (hashtag #SBS) where each Sunday, small businesses from all over the country are invited to tweet Theo a summary of their business. 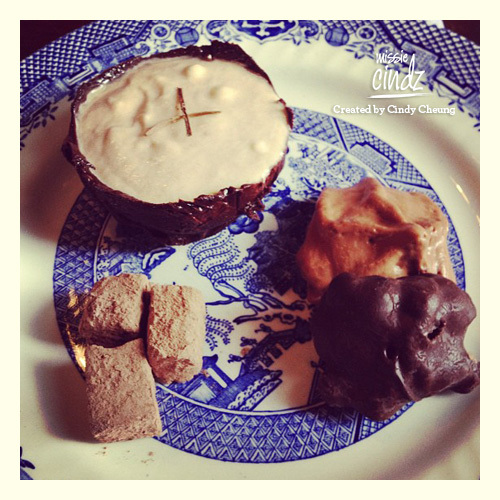 He then reviews the entries and picks his favourite six to retweet – very well down #Brownies! Next up was course 3: a white chocolate mousse cupcake in an edible dark chocolate casing made by Hannah Hemmings (T: @memhem) and Leah Griffiths (T: @griffindale) on behalf of The Broadfield Pub, Abbeydale Road (T: @theBroadfield). These cupcakes didn’t last long! Each cupcake was hand crafted to create an edible dark chocolate case which was then filled with a sweet white chocolate mousse/ganache and ‘hidden’ raspberry coulis, topped with a raspberry – these were beautiful and elegant to look at. You both have patience beyond compare for the art of baking! 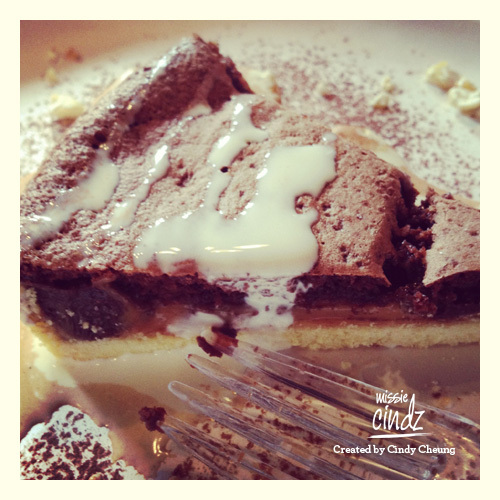 Charlotte with her Chocolate Millionaire Pie – blingin' sweet stuff! Next up was Course 4: Chocolate Millionaire Pie served with cream and crushed popcorn made by enthusiastic baker, Charlotte Turner. 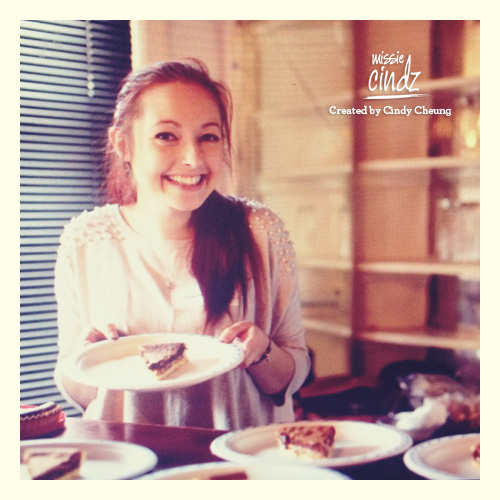 Charlotte enjoys baking in her spare time, baking up artisan cakes for family and friend’s and special occasions. Charlotte first came to our Pud Inn back in March and when I asked if she would get involved with the day’s treats – I’m so pleased she didn’t turn me down. Her pudding course went down really well with the diners! Beautifully presented – with a light crunchy pastry base filled with a chocolate pudding type middle and a cakey-type topping. It’s actually hard to describe this pie (a clever twist to the millionaire shortbread) – it was a kind of half pie and half cake type pudding. The crunchy popcorn pieces complemented the soft pud well too. It was a delicious, light dessert – perfect for summer. Finally, Course 5: Rhubarb and Chocolate Mousse served with PJ taste ‘surprises’ made by Sheffield’s localvore, Peter Moulam of PJ taste. Peter tells me the choice of his dessert was lead by the seasons and locally available food – how rhubarb is plentiful in his allotment at the moment and that elderflowers are coming to the end of their short season and he wanted to make use of them before we missed them for another year. Peter also felt rhubarb would add a contrast of sharpness to the rich chocolate theme and elderflower a taste maybe that diners had not had with chocolate before. Finally an element of fun in the “surprises” were the chocolate coated tempura elderflower (a texture contrast), accompanied with white chocolate and elderflower foam. 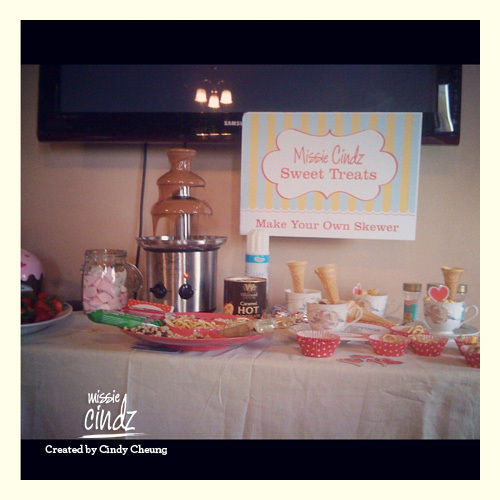 I loved the idea of having a chocolate fountain, making sure this was surrounded by an assortment of different fruits and other delectable treats which our diners could dip in the chocolate. Dipping items such strawberries and non-fruits (cookies, marshmallows, popcorn and pretzels and more – just look at our table of treats above) – I called this the “Missie Cindz Sweet Treats‘ table encouraging diners to create their own skewers. Every 2-3 month at Pud Inn, we have a chance to see familiar faces, give and build a great Sheffield community – something that I believe we should be doing on a daily basis. Part of the welcoming spirit is that we keep our price to attend really low and add in activities that gets diners engaged and participating with what they’re eating. Even if you don’t know the food producers and don’t know what to expect, it all adds to the Pud Inn experience. I enjoy seeing the anticipation and build up of each event – people asking me “what puddings are being served Missie?” and “who’s taking part? “. The bakers participating also get really into it too, getting excited about what they can bake up for us. All of this helps to get people talking about puddings and shows how Pud Inn provides a focal point for discussion, sharing of ideas and builds new friendships. A personal big thank you to all our pudding makers for the day’s treats – without their generous help, time and effort Pud Inn wouldn’t be possible – plus, not forgetting the Rutland Arms for being the ideal place to have puddings. We have all made a contribution to Pud Inn in our own time for the love of a good British pudding and bringing community (people) together – now, who said community spirit was dead!? 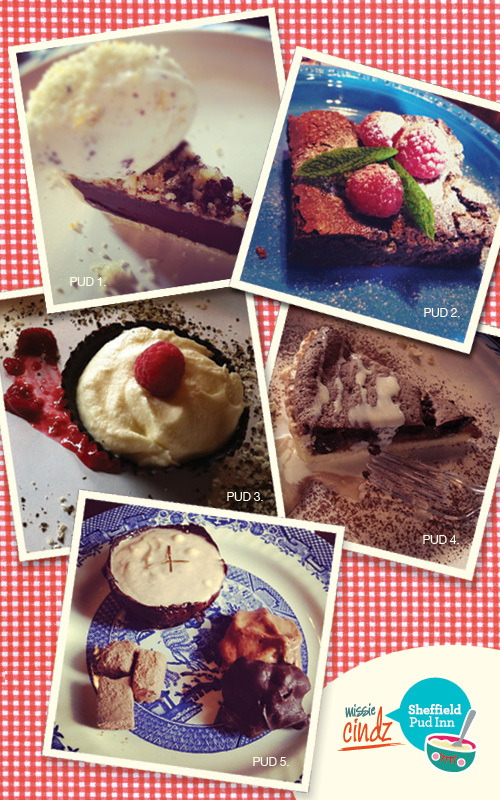 So who was voted diners favourite pudding I hear you ask? 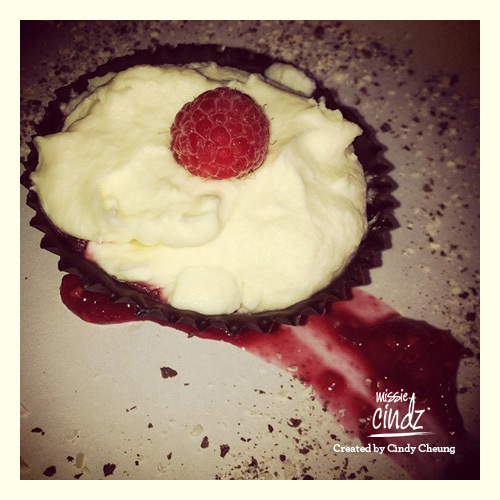 (drum rolls please…..) – Pudding number 4 made by Charlotte Turner. 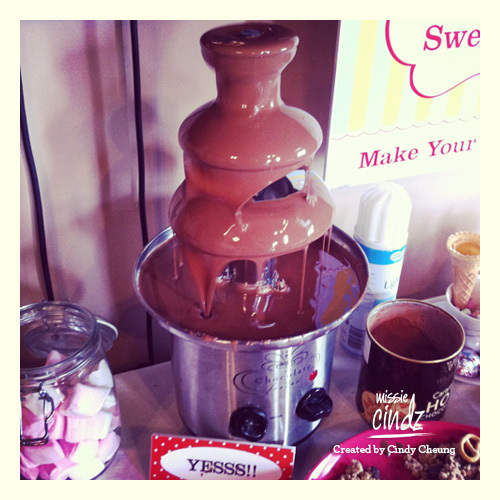 A big thank you to food blogger, Keri Rowsell (@LilMissHungry) who attended our Choccy Pud Inn last week for her account on our event. 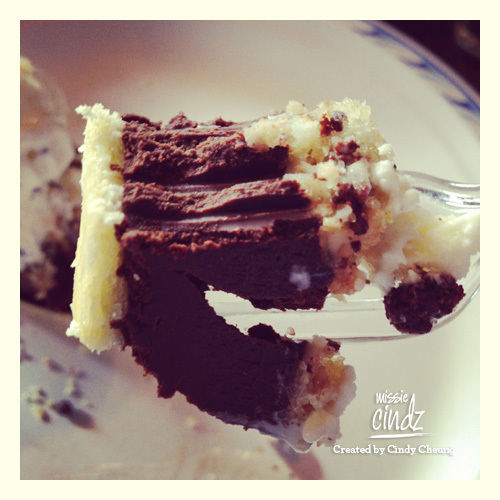 You can read Kerry’s post here: Missie’s Pud Inn: Chocolate. Sheffielder Clare Farmer (@pinklittlebean) also deserves a sweet mention for attending all FOUR of our Innings. Amazing – thank you Clare for your support. I’m sorry to those who weren’t able to purchase tickets to our Chocolate Pud Inn and wanted to join. I will be planning our next event very soon in SEPTEMBER and hope you will be able to join me for that?